With the help of Pools & Spas Service, Inc., you can have the backyard of your dreams by updating your old or worn out pool decking. With dozens of patterns and colors to choose from, the possibilities are limitless. 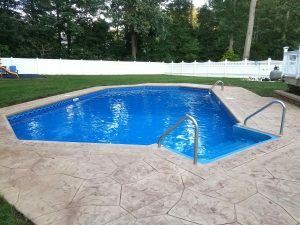 If you’re ready to fix your unsightly or worn pool decking, make the call to Pools & Spas Service, Inc. now and we’ll schedule a free, no obligation consultation with one of our professionals. Our stamped concrete system is a great way to add a decorative element to your concrete pool decking. The specialized technique we use allows plain, grey concrete to take on the look of many others surfaces with much less maintenance involved. with the purchase of a new stamped concrete renovation (min. 1000 sq ft.)* Call for details.